Michael Faraday, FRS (September 22, 1791 – August 25, 1867) was an English chemist and physicist who contributed significantly to the fields of electromagnetism and electrochemistry. He established that magnetism could affect rays of light and that there was an underlying relationship between the two phenomena. It was largely due to his efforts that electricity became viable for use in technology. The SI unit of capacitance, the farad, is named after him, as is the Faraday constant, the charge on a mole of electrons (about 96,485 coulombs). Faraday's law of induction states that a magnetic field changing in time creates a proportional electromotive force. 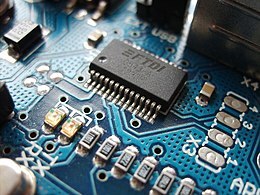 This list of electronic components is intended to make drawing of schematics simple, fast and very flexible. A mouse. 1: Pulling the mouse turns the ball. 2: X and Y rollers grip the ball and transfer movement. 3: Optical encoding disks include light holes. 4: Infrared LEDs shine through the disks. 5: Sensors gather light pulses to convert to X and Y velocities. The GeForce 6600 (NV43) was officially launched on August 12th, 2004, several months after the launch of the 6800 Ultra. With half the pixel pipelines and vertex shaders of the 6800 GT, and a smaller 128-bit memory bus, the lower-performance and lower-cost 6600 is the mainstream product of the GeForce 6 series. The 6600 series retains the core rendering features of the 6800 series, including SLI. Equipped with fewer rendering units, the 6600 series processes pixel data at a slower rate than the more powerful 6800 series. Electrical resistance is a measure of the degree to which an object opposes the passage of an electric current. The SI unit of electrical resistance is the ohm. Its reciprocal quantity is electrical conductance measured in siemens. The quantity of resistance in an electric circuit determines the amount of current flowing in the circuit for any given voltage applied to the circuit. where;R is the resistance of the object, usually measured in ohms, equivalent to J·s/C2, V is the potential difference across the object, usually measured in volts, I is the current passing through the object, usually measured in amperes. For a wide variety of materials and conditions, the electrical resistance does not depend on the amount of current flowing or the amount of applied voltage. V can either be measured directly across the object or calculated from a subtraction of voltages relative to a reference point.